According to second largest regional newspaper in France, Le Parisien, Daft Punk have found a new home on Sony subsidiary, Columbia, leaving EMI for their upcoming fourth studio album. The information was reportedly told by Guy-Manuel to his friends at a Kavinsky album release party last week. 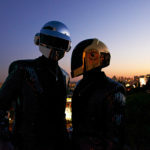 Following in the footsteps of Depeche Mode who also left EMI for a US-based label, Daft Punk is currently in the process of finalizing its contract with Sony/Columbia, slating the upcoming album’s worldwide release for sometime this spring. Aside from scoring Disney’s Tron, this marks their first official release since 2005’s Human After All but other than their collaboration with Nile Rodgers of Chic, little else is known about the album from the two enigmatic producers. Follow @dancingastro on Twitter for up to date information on this news as we get it.